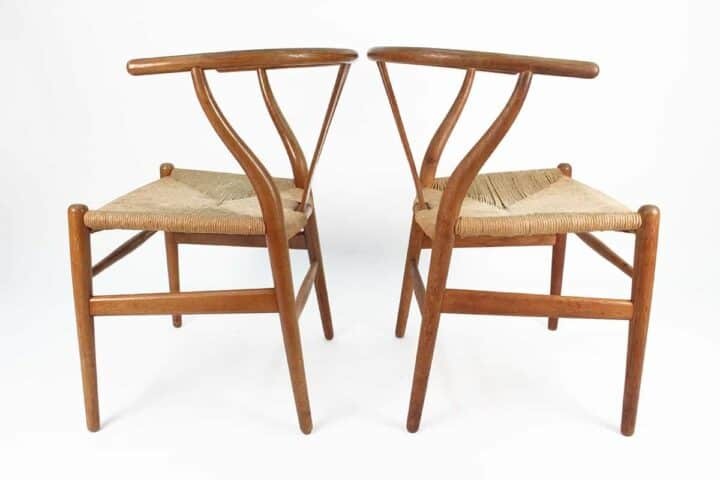 Two iconic Wishbone Chairs by Hans Wegner. This chair epitomizes the Asian influences in Danish Modern design. Hans Jørgensen Wegner: A world renowned Danish furniture designer, born in Tønder in 1914. He was the son of shoemaker. He grew up admiring his Father’s mastery of the tools of his craft, which in part led him to become an apprentice cabinetmaker. He continued his studies at Copenhagen Technical College, then the Copenhagen School of Arts and Crafts. In 1938 Wegner started work for the architects Erik Møller and Flemming Lassen in Aarhus. Two years later Wegner was offered a job at Arne Jacobsen’s design studio, who were charged with the task of designing Aarhus Town Hall. 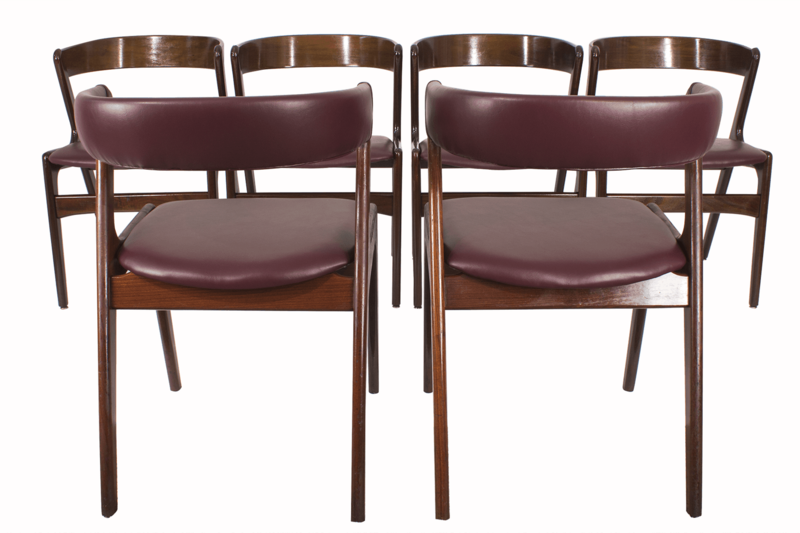 During the war Wegner, together with Børge Mogensen, designed furniture for FDB Møbler, which at the time supplied furniture in Denmark. Their task was to create furniture that was affordable to everyone. Wegner and Mogensen becoming lifelong friends. Wegner was also associated with cabinetmaker Johannes Hansen. Wegner designing the furniture and Johannes Hansen producing it. 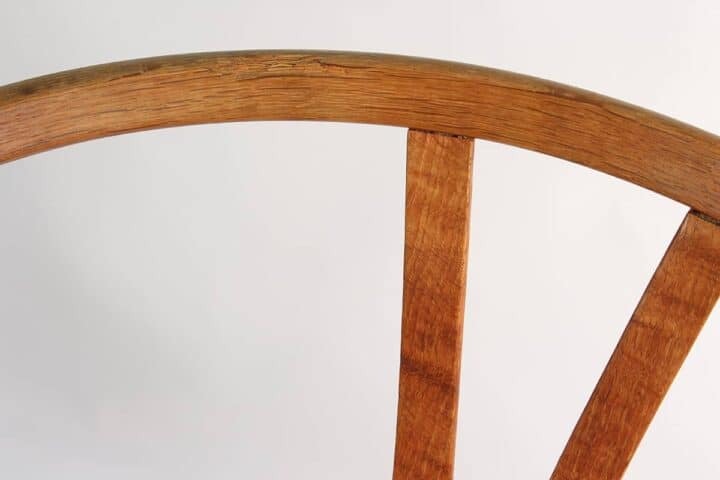 A surge of popularity ensued after the US magazine ‘Interiors’ displayed Wegner’s ‘The Round Chair’ on its cover and called it the world’s most beautiful chair. A rush of orders from the USA, created problems for Wegner, as all the chairs were being handmade. In 1961 the chair became even more famous when used on TV in a presidential debate between Kennedy and Nixon. After this, it became known as ‘The Chair’. 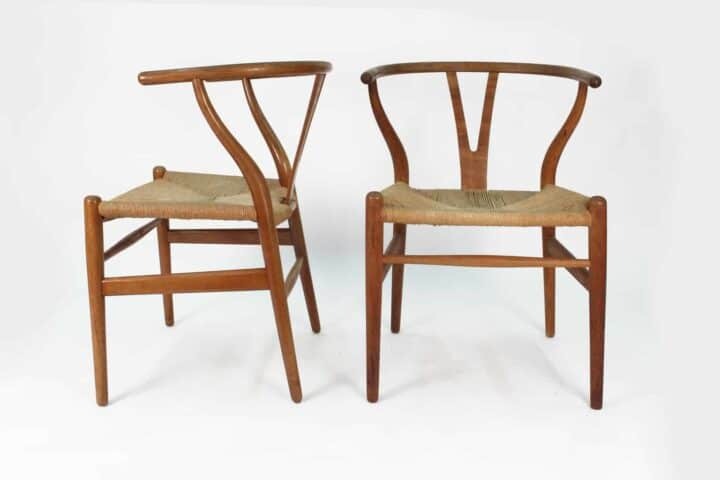 Wegner’s Danish modern designs continued to gain popularity throughout his lifetime, ‘The Peacock Chair’ came in 1947, the ‘Wishbone Chair’ and ‘Flag Halyard Chair’ in 1950, the ‘Pappa Bear Chair’ in 1951, the ‘Valet Chair’ in 1953, and the ‘Ox Chair’ in 1960. 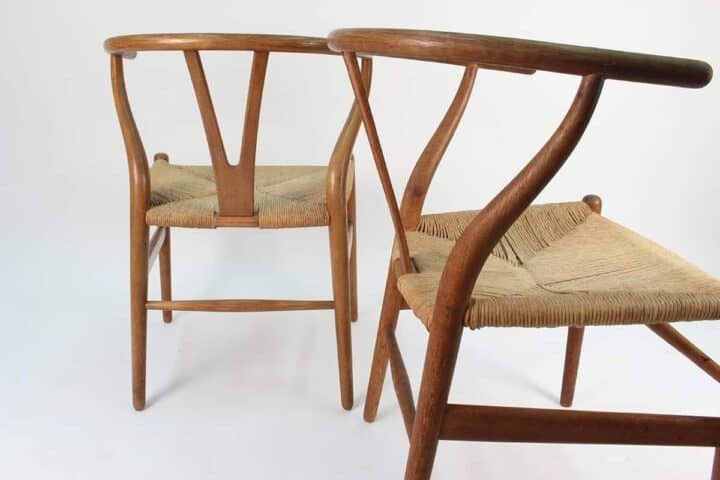 Wegner’s high quality and thoughtfully crafted designs, along with the effort from several of his manufacturers, contributed to the international popularity of mid-century Danish design. His style is often described as Organic Functionality, a modernist school with emphasis on functionality. Wegner died in 2007 at 92 years of age.